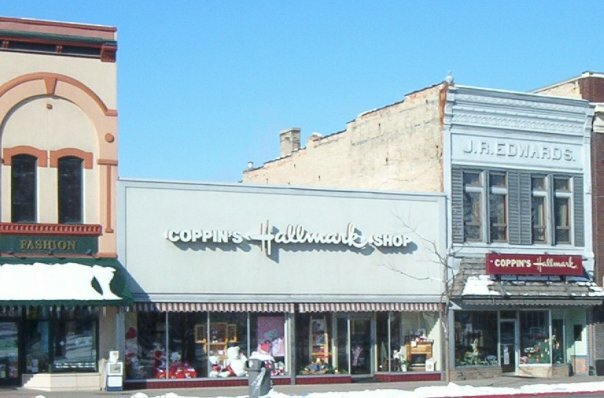 Coppin's Hallmark began in 1993 with one store in Logan, Utah. 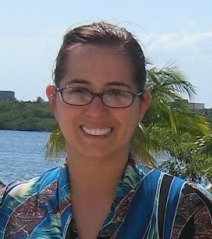 An online pioneer, Coppin's established its first online website in 1996. Coppin's Hallmark has become one of the largest volume independent gift retailers in Utah and across the west (and online across the entire continental US). Coppin's has won awards, and top dealership status with many top gift brands including Precious Moments, Boyd's Bears, Willow Tree, Ty, Webkinz and more. Coppin's Hallmark strives for 100% satisfaction and offers service guarantees on shipping, quality, and satisfaction on all of your purchases, so you can be assured that you will be happy and that your order will be fulfilled quickly and accurately. I was very fortunate to be able to check out a great gift from Coppins Hallmark, a Jim Shore Figurine. The Heartwood Creek By Jim Shore Disney Traditions Sorcerer Mickey $18.00 retail value. The summer is almost here and with it comes a lot of gift giving events, from Father’s day to multiple birthdays and graduations. I know I am always in search of a perfect gift for someone, it seems like I am always looking for a gift in the summer. But now I know where I can get great quality gifts for all of my special occasions all at a great price with Coppins Hallmark. 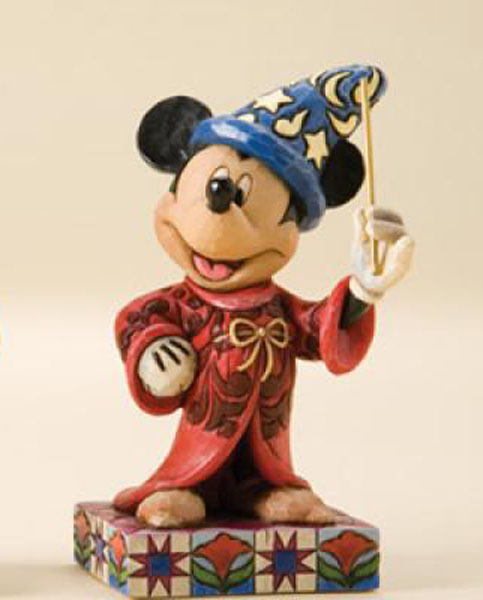 The figurine I choose, was the Sorcerer Mickey, Cherish Mickey Mouse in his most memorable cartoon as Sorcerer Mickey, complete with the magic hat and gold metal wand. The size of the figure is 4.25" and it is made of stone resin. The figurine is a quality piece, something I would expect from Hallmark. This little guy will be displayed on my desk at work. It is just the right size to display, it will get noticed but it is not so large that it will get in the way of things. My grandmother was always a person that loved to collect knick knacks… she loved all of the little characters that would fill the china cabinet, and her end tables. I can see why she would love to have these decorations around, they would remind her of things she loved. And that is a great thing. I love this Sorcerer Mickey figurine it reminds me of the fun times at the Disney parks with friends and family. So if you are looking for a great gift for that special someone, Coppin’s Hallmark offers many top gift brands including Precious Moments, Boyd's Bears, Will Tree, Ty and more! You will be sure to find a special gift for that special person in your life. Coppins Hallmark offers Free Ground Shipping in the Continental U.S. on orders over $30. That is a great reason to stock up on gifts now. All Orders Ship Out Same or Next Business Day! So you still have time to shop, make sure to check the site out soon. The generous folks at Coppins Hallmark are giving one of Susan’s Disney Family readers a chance to win their choice of item from this list from Coppins Hallmark Gifts, You can choose either the, 3 DaVinci Beads & Toggle Bracelet, Willow Tree Figurines (up to $20), Jim Shore Figurines (up to $25), Wubba Nub (up to $15), 1 Hand Warming Mug, 1 Game (up to $15). You get to choose the prize you would like! Isn’t that great? Would you like to win? Please visit the Coppins Hallmark website, take a look around then come back here and tell me what you love from the site. There are also other ways to enter, please enter below. I'd like the Heartwood Creek By Jim Shore Disney Traditions Sorcerer Mickey. The figurines look very nice and classy. Very nice! Love this blog. I like their Precious Moments Holy Family Nativity Waterball! Thanks so much for the fantastic giveaway! Heartwood Creek by Jim Shore Disney Traditions Snow White and her Prince I have love snow white since I was a kid. I would really like a Jim Shore figurine. I liked the Willow Tree Angel of Comfort, but living in Michigan I would pick the hand warming cup. I want a Jim Shore cardinal. Probably something Mickey Mouse. My sister collects Mickey stuff. I love the Willow Tree Around You. I would love the Brown Hand Warming Cozy Mug. My family has wanted the Bananagrams game for a while.. would love to win it!